[Fashion Week] Scavenger Hunt - win a meow suit!! 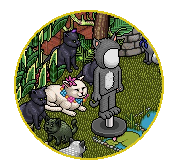 Thread: [Fashion Week] Scavenger Hunt - win a meow suit!! You've all met our wonderful General Manager lawrawrrr right? The cool, calm, and collected 'get everything done on time' GM? Well at the HxSS awards party things got a bit crazy, she was less collected and more 'life of the party'! Let's just say, lawrawrrr lost a few things that night that she desperately needs to get glam for Fashion Week(end). Habboxers are great detectives I've found, so are you ready to help poor lawrawrrr? Below are three suspicious people we think may have taken the items. Figure out the clues from our rather useless witness, find the items on the suspicious people's profiles, and let's get lawrawrrr to Fashion Week(end)! All you saw was a swish of yellow and lawrawrrr's shoes? There must be more? She was also carrying a bag of credits? Did that seem like competitions prizes to you? A flying monkey you say? 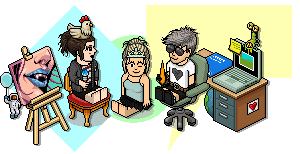 That can't be right, surely you've had too much habbo cola? Well if they were definitely flying off with lawrawrrr's bag maybe they were a flying something else? Are you sure it was a James and not a Jamie? Gosh, this is confusing. Think you know who took lawrawrrr's accessories? Send ForumGod a PM by clicking here with the correct user profiles to be in to win! Prize: 1 month VIP + a MEOW SUIT! Last edited by lawrawrrr; 16-09-2018 at 12:13 PM. This scavenger hunt is NOW OPEN!!! Don't forget if you want to quickly visit someone's profile to check if they've STOLEN MY CLOTHES you can do that by going to habboxforum.com/user/lawrawrrr - obviously substitute the username! !